Light & Darkness Radio: Featured Today! "Lacrimosa, Ayreon..."
Keep Suggesting L&DR to all your friends almost 1k fans!! I'll keep this post short because I'm having a long day! haha Here's Today Featured bands! Lacrimosa (DE/CH) - In November 1990, the first music tape from a Swiss band gathered a lot of attention in the independent and underground scenes of that time. Emotional music, leavened by classical influences, with unusual poetical lyrics, fascinated and revived a slowly dying scene. This was the birth of LACRIMOSA, a one-man-project by the German-born Tilo Wolff. Tilo Wolff formed the record label, HALL OF SERMON, for the first longplay album, to ensure LACRIMOSA the absolute and unconfined artistical freedom. Previously, the stylistic devices that were used by LACRIMOSA improved from album to album, without following any musical trend; thereby still connected to its own roots. With this progressive development, LACRIMOSA supported the tolerance between music lovers in a widespread audience of alternative music. In the beginning of 1994 (along with many guest-musicians) Anne Nurmi joined LACRIMOSA as a second and permanant member. Anne Nurmi, who was part founder, and also a singer and keyboard player of the Finnish band TWO WITCHES, put new emphasis within the music of LACRIMOSA with her extraordinary voice and composing skills. Lacrimosa's first album, Angst, is a very gloomy piece of slow, rather minimal music, dominated by keyboards and a depressed, sometimes frantic and insane, voice. In this early period, the themes explored through lyrics and music are of a very bleak nature, such as fear; helplessness; loneliness; the non-existence, unattainability or illusionary nature of love; and death. The same thematic preoccupations can be found on the next three albums, Einsamkeit, Satura and Inferno, but now and then a more positive note begins to sound in the dismal tapestry. Musically, this period is characterised by the introduction of electric guitars and basses, with more and more rock elements being added to the slow, keyboard-based music of the earliest album. With Stille, Lacrimosa releases an album that might easily be classified as 'metal', a style which they'll keep using for their own purposes from then on. Heavy guitars supplemented by more bombastic arrangements for classical instruments have come to dominate the music, showing a close affinity to symphonic metal. Thematically, the emphasis on the darker side of human emotions is lowered if not abandoned, with Stille featuring several uplifting songs. "Stolzes Herz" ("Proud heart") and "Die Strasse der Zeit" ("The Lane of Time") especially sing the praise of individual and cultural strength respectively. "Die Strasse der Zeit" describes a journey backwards through a history ravaged by war, greed and stupidity, until the protagonist finds solace in the youthful hope and strength of ancient Greek culture - an image which reminds one more of Nietzsche than of the depressed songs on Angst. The next album, Elodia, reduces the role of metal-style guitars and increases that of symphonic, classical arrangements, this time recorded in part by the London Symphony Orchestra. Presented as a play in three parts, Elodia revolves around the most popular theme in musical history, love. The gothic element is still present, though, and the themes of loss and death feature prominently in the latter half of the 'play', which nevertheless ends with an affirmation of hope. The musical style of Elodia is still evident on the 2001 album Fassade, which features a wide variety of musical visions, from the harsh metal sound of "Liebesspiel" ("Love Game") to gently flowing keyboards of "Senses", to the symphonic interplay between guitars and orchestra on the title song "Fassade". This latter composition, a piece in three movements which are arranged on the album as tracks 1, 5 and 8, also constitutes a new thematic excursion of Lacrimosa as they move from the personal emotions they normally explore to a critique of modern society. It ends, however, with the affirmation of individuality and the protagonist's retreat from society. Echos bears witness to a further musical development, as guitars and other rock elements take centre stage less and less often, whereas classical instruments feature more prominently. The orchestral arrangements move away from the standard symphonic arrangements which are often found in contemporary metal music, as is clearly shown by the album's first track, the long orchestral "Kyrie - Overture". The music on Echos also shows an influence from electronic and industrial music, as is especially obvious in the song "Ein Hauch von Menschlichkeit" ("A Touch of Humanity"). Overall, this album is more personal, more 'classical' and more quiet than those that came before it. Thematically, there is less change as Lacrimosa continues to explore love and its associated emotions with gothic twists. Lacrimosa's ninth album, Lichtgestalt, largely retains the classical orientation of Echos, but rock elements begin to resurface. In particular the first track, Sapphire, begins as a slow, mostly classical song but around halfway through moves into a far more metal-sounding section; the pace of the song increases, a heavy guitar backing takes over and Wolff switches from singing into a rasping, high-pitched death grunt for a few minutes. The segment is a significant change of direction for Lacrimosa; this vocal style had not been seen in Lacrimosa songs since Copycat on the 1995 album Inferno, recorded ten years before. The remaining songs display a similar mix of styles to previous albums, with some upbeat songs, a song written and sung in English mainly by Anne Nurmi (though Wolff duets with her on this track) and some slower-paced, more depressive pieces. In 2005, a new EP, "Lichtgestalten" is released, that brings a new electronic version of the song "Lichtgestalt", produced by Tilo in the scope of his solo project, Snakeskin. In 2006, a DVD "Musikkurzfilme" is released, which contains all the video clips that Lacrimosa shot throughout its career including the video for "Lichtgestalt" song. The main musical development of Lacrimosa might be summarised as follows: starting from the minimal, slow, keyboard driven style of Angst, guitars and other metal influences came to play a more and more prominent role, until they reached a peak on Stille. From then on, the emphasis has shifted from guitars and metal to symphonic and classical writing, which is clearly shown in Fassade. Finally, Echos takes a turn towards the personal and away from the symphonic and heavy aspects of the previous albums, achieving a quite unique mixture of musical elements which is hard to classify. The pace of Lacrimosa's development is slow enough that each album is recognisably linked to its predecessor and successor, yet fast enough that for instance Angst, Stille and Echoes might well have been written by completely different bands. In 2008 the Lacrimosa-run Hall of Sermon label reclaimed the rights on all the band's Nuclear Blast releases. Unavailable for quite some time, two albums and two singles will be re-released. In March 2008, Lacrimosa started working on their next studio album entitled "Sehnsucht" which was released May 8, 2009. Ayreon (NL) - The first Ayreon CD, released in 1995, is The Final Experiment, which has a mixture of science fiction and medieval themes. The album features thirteen singers and seven instrumentalists, most of them Dutch. The Final Experiment is often mentioned as one of the first metal operas and a reviver of the rock opera genre. 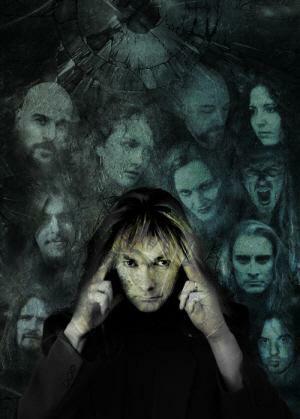 The album was originally titled Ayreon: The Final Experiment, with the artist listed as Arjen Lucassen, but upon re-release, the title was changed to The Final Experiment, and the artist was changed to Ayreon. Actual Fantasy from 1996 is the only Ayreon album without a continuous story. With its individual fantasy stories, it can still be considered a concept album, though. There are only three singers and three instrumentalists on Actual Fantasy. Themes inspired by songs on this album can be found on later Ayreon releases, particularly the two Universal Migrator albums. The album did not sell as well as its predecessor. The double album Into the Electric Castle followed in 1998. The album features eight singers, each playing a role of a single character, and eleven instrumentalists. Arjen has stated that he wanted this particular album to be a more flight-and-fancy-free record, or "pure escapism" than the previous albums' more serious tones, and portrayed his characters in more of a B-Movie light. The album was a huge success and is widely regarded as one of Ayreon's best albums. The twin Universal Migrator albums were released in 2000. The first album, The Dream Sequencer consists of soft, atmospheric progressive rock, whereas the second album, Flight of the Migrator, consists of a more heavy metal theme. Both of the albums feature around ten singers supported by many instrumentalists. One of the more notable guests was Bruce Dickinson of Iron Maiden, who made an appearance on the Flight of the Migrator album. Shortly following Universal Migrator came Ayreonauts Only, an album generally meant to be only for diehard fans of Ayreon. The album itself was the second to not follow a specific storyline; it instead contained alternate versions (With different vocalists or instrumentalists) of existing songs, or the original demos used when recording them. In addition, it contained a preview of Arjen's then-upcoming project, Ambeon. It is the only Ayreon album not to see re-release on InsideOut. In 2004 came The Human Equation. As on Into the Electric Castle, there are several singers, each playing their own role. With The Human Equation, Ayreon turned away from the usual science fiction and fantasy themes with a seemingly semi-normal psychological theme. Starting in 2004, after changing from Transmission Records to InsideOut, Arjen began rereleasing his Ayreon catalog on the new label, with enhancements ranging from basic (The Universal Migrator, issued as a two-disc set instead of two separate albums) to drastic (Actual Fantasy, "Revisited" with completely re-recorded drums, bass, synth and flute). In 2005, to coincide with the 10th anniversary of Ayreon, The Final Experiment was reissued with a bonus semi-acoustic disc. At the end of September 2006, when Arjen's new studio was finished, he began making a new album entitled 01011001, which was released on January 25, 2008. This album was noticeably darker than previous Ayreon releases, Lucassen attributes this to a depression and his divorce in the preceding year. On April 25, 2008, Arjen released a new Ayreon EP named Elected. The EP features two tracks from 01011001, one from The Human Equation and an Alice Cooper cover (Elected), with vocals by Arjen and Tobias Sammet. On September 16, 2008, Arjen announced in his official website the release of Timeline, his second compilation album, that will reunite selected songs from all Ayreon albums and an unreleased one in three CDs and a DVD. The album was released on November 7, 2008 in Germany, Austria and Switzerland and all of the EU on November 17, 2008. It was released in America on January 13, 2009.